Thank you to Lydia for letting me know about Woolly Wednesday. On the first Weds of each month, bloggers can join together to share their creative adventures. As well as the sharing aspect, I thought it might be useful to have a regular look at my current projects. So here goes. 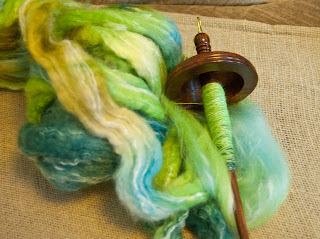 I've two 'active' spinning projects right now, both spinning by drop spindle. My friends will be sick of me posting pictures of this loom which I warped back in April. It's still in progress - partly because of getting distracted by other projects, and partly because... it's just taking a long time. The warp is long, long enough for two curtains, hems and tabs, but I can see the end of the warp on the back roller now! Warp is commercial cottolin, weft is merino / silk mix handspun with a spindle and woven as singles. This next one is a secret, so don't tell anyone. It's the first picture I've posted of the project because I've not officially started it yet. I'm trying to resist picking this up but the fibre (from YummyYarnsUK) is so beautiful, I sometimes do a little as a break from the other project. Love the water sprite colours. And wow, that must have taken a while to spin for the weft of the curtains. Curtains - that does sound ambitious. 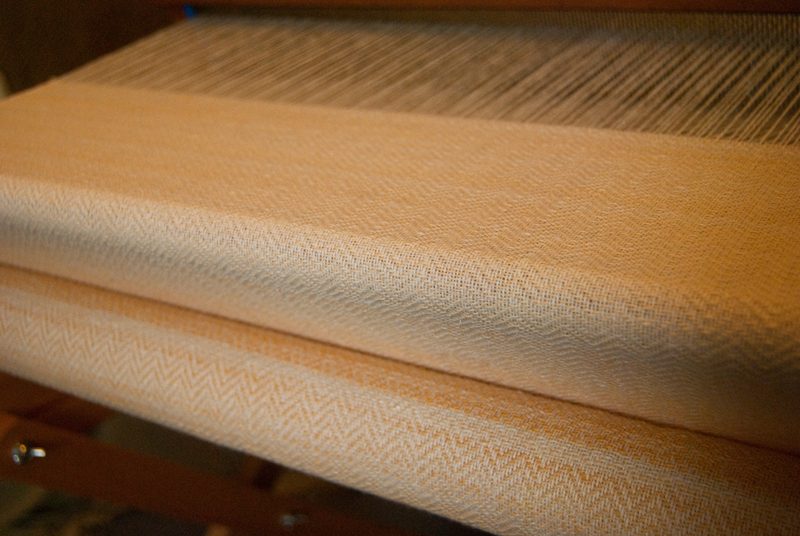 The weaving looks lovely. The fibre is beautiful no wonder you can't wait to start spinning it! Your weaving looks beautiful and I love the colorway of your soon to be sock yarn. I recently bought a second hand loom and am excited to get to starting something. It all looks so beautiful! You are very clever. Thanks for stopping by and being so encouraging! Don't you absolutely love it when you can see the back roller coming into view!! One of a weavers greatest joys.